Grainy, yet under-exposed. I can’t find the correct light setting for my 10x macro lens. The 1x, 2x, & 4x lenses give me no trouble. The 10x lens does not record what I see through my view finder and I still don’t know why. This shot was taken on a bright, sunny day and I was standing in full sunlight. Obviously the 10x lens seriously blocks light intake. Why? And can I counter it short of getting spotlights, or are spotlights the answer? Well I wouldn´t have a clue about lenses and filters and settings. But I think this is a really interesting photo. Especially since you mentioned that it was taken in full sunlight. I don’t know the technical answer, but I still think this is a very COOL photo — I think you can frame this and call it “Art”! I have no answers, but you just reminded me that I have an artful muffed target! Unfortunately, I don’t own a good camera and all the lenses that go with it (yet), so I am of no help to you. 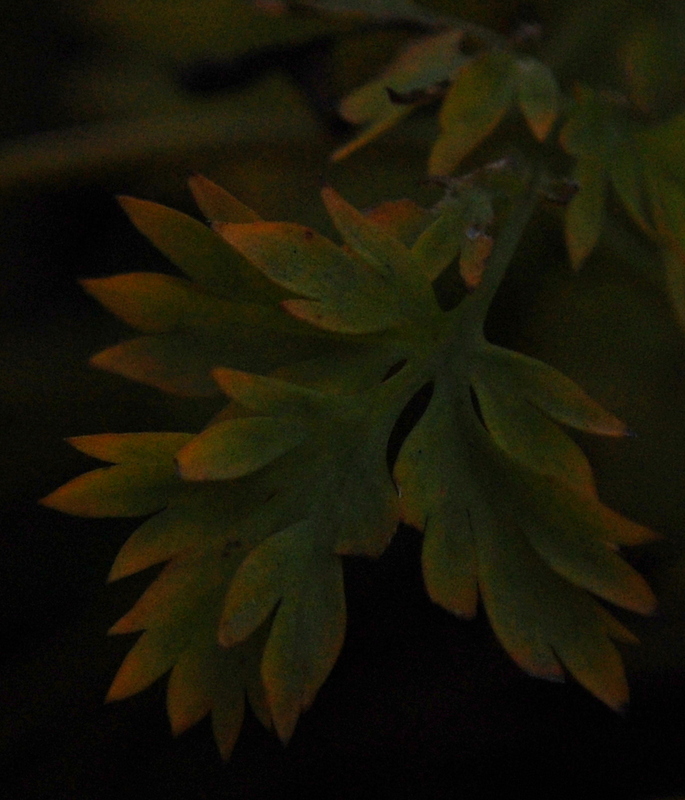 Even though it is a little dark, the photo reminds me of a old tapestry print of some kind. Wish I could help, but I’m clueless. I haven’t done these but I should. I never throw stuff away, even the bad. I believe you, this meme really fits in Thom’s “well whatever” category. If it’s not what you were looking for, it still came out awesome — I love those autumn colors and the shadowy feel is really lovely. Good luck getting those macro settings down! I need to finally learn my camera’s abilities too — I’m ‘auto’-dependent unfortunately. I feel your pain in not getting it right.